A new language from MIT's Media Lab makes it easy for kids to develop programs that interact with things in the real world: Pencils, paper, water, and even vegetables. a new progaming language called "Scratch", is not so much a procedural language as an environment for creating interactive animations, annotated stories, slideshows, prototypes and games. It's designed to be as simple to use as possible, so kids as young as 8 can get started building their own animations with minimal preparation. Scratch is designed to interoperate with an external sensor kit called a PicoBoard. 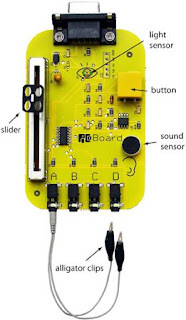 This $50 circuit board includes a microcontroller, a button, a slider, a light sensor, a microphone, and four ports for measuring the resistance of circuits. It connects to a computer using a serial-to-USB cable, and immediately starts delivering data that can be used by Scratch programs. a sprite can be made to grow or shrink based on the electrical resistance of a circuit connected to one of the PicoBoard's ports. as an example of how the system works....,jay silver(a member of the M.I.T reserch team that wrote the language and designed the pico board)demonstrated the kit by attaching one lead to a pushpin stuck into a #2 pencil, and the other lead to a line he scribbled on a piece of hotel note paper. Because graphite is somewhat conductive, touching the tip of the pencil to the line completed a circuit. The Scratch software was able to read the resistance of that circuit and make a cartoon cat grow or shrink in proportion, depending on where on the line Silver placed the pencil.